Each week I'll highlight some of the things I'd like to accomplish that weekend. This could include specific birds to chase, places to see, eBird milestones to achieve, or experiences to enjoy. 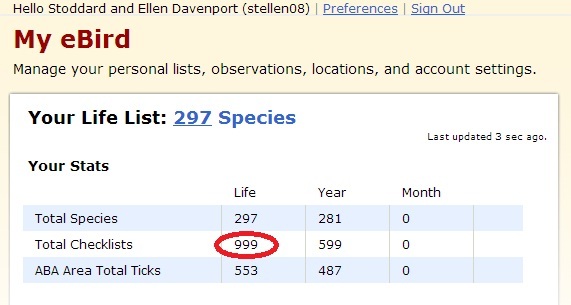 This weekend Ellen and I expect to hit a big milestone for us: 1,000 eBird checklists! In our two years of birding we have made a point to submit all of our observations to eBird (go citizen science! ), and it has made a tremendous difference in how we approach birding. We were lucky enough to discover eBird before we got serious about birding, and have been using it since day one. In fact, when we first started birding, it was our desire to submit complete and accurate checklists that encouraged us to step up our birding skills (always a work in progress) and make a point to identify and count every bird that we saw, not just the easy or fun ones. Since we have dutifully entered all of our bird observations into eBird, the species and checklist counts that eBird automatically calculates are an accurate tally of our entire birding experience. 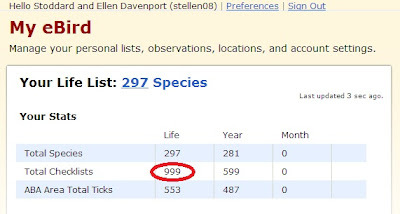 Some birders with a lot of experience that pre-dates eBird struggle to get as excited about eBird, since it will never fully represent their birding accomplishments (though you could always enter your historical checklists!). For us, birding and eBird are almost one and the same. It's the resource I spend the most time with when preparing for our weekends (more on this to come), and its the record of all of our birding efforts. Being the data junkie that I am, it was hard not to get hooked when I first learned about all of the information accessible through eBird. I'll admit I purposefully turned a blind eye towards a few of the more common birds around town this week, since I really wanted my 1,000th checklist to include a lifer. I submitted list #998 at the end of last weekend, and couldn't help but use list #999 to record a Spotted Towhee right outside my window that woke me up one morning this week, but then I made sure not to see anymore birds until the weekend! I wanted to use list #1,000 for one of the target birds we were hoping to pick up this weekend. being buzzed by a Spotted Towhee that did not want its picture taken. Adams County, Colorado. November 29, 2012. "Rare fall and extremely rare spring migrants through Colorado, mostly on larger reservoirs along the Front Range; perhaps most common in South Park in October. Surf is perhaps twice as common as White-winged, which in turn is several times more common than Black." We've heard quite a few reports for all three scoters up and down the Front Range this winter, but so far we've dipped on every chase. Hopefully this weekend will be different! "An uncommon resident in extreme eastern Colorado, almost entirely in the large river riparian corridors. Easiest to find in the winter in hedgerows or Russian-olive thickets, especially in the Bonny Reservoir area." Lucky for us, a beautiful male Northern Cardinal seems to have strayed a little farther than most and has been giving people good looks in the Boulder foothills for the past couple of weeks. We made an attempt at this guy last weekend, and failed. Here's hoping he doesn't evade us again this weekend! Rusty Blackbirds have been been showing up in several places throughout the greater metro area this winter, including Chatfield State Park (Jefferson and Douglas Counties), Cherry Creek State Park (Arapahoe County), and Walden Ponds (Boulder County). 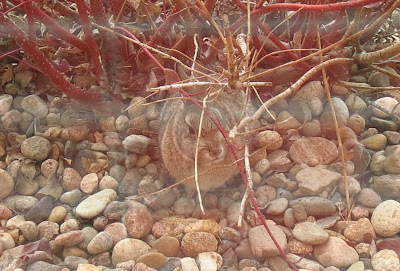 We chased a report at Chatfield State Park a couple of weeks ago, but weren't able to find the bird. A more recent report indicates a Rusty has been hanging out at Boulder Creek west of 75th Ave (Boulder County) for the past few days. eBird's occurrence maps show that Winter Wren's are definitely possible in Colorado, though we are definitely on one of the farther edges of their boundaries. Sightings in the Denver metro area have been few and far between this year, so we were excited to hear a report from Boulder Creek west of 75th Ave (Boulder County) this week. eBird occurrence maps showing sightings from all years across North America (left), and just this year in the Denver area (right). This would be a nice one to get, as we've been quite successful with other wren species this year. We've seen House, Rock, Canyon, Bewick's (first eBird record for Jefferson County! ), Pacific, and Marsh, so it would be nice to add a seventh.